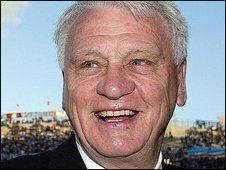 Really sad to hear the news of the death of Bobby Robson. For English men and women of a certain age he will forever be remembered for playing a key role in Italia 90 – which is still for my money the most memorable World Cup ever. It was such a beautiful few weeks and I was young enough, and single enough, to have watched pretty much every single game. It was astonishing watching a pretty poor England team suddenly grow in stature to the point where had they been a bit more imaginative with their penalty taking they might have won the thing. A few years later I was in Barcelona for a trip and we ended up staying at the hotel next to the stadium. Robson had recently been confirmed as manager and we were convinced he was staying in the hotel and spent ages trying to get the guy on reception to confirm this. Sure enough after a Estrella powered afternoon session we staggered back to the hotel just in time to leap in front of Bobby’s BMW just as he was pulling away. Somehow he managed to slam the brakes on and avoid us, and even remained cool when we rather sheepishly started telling him much we loved him. Instead of screaming abuse at a pair of pissed English blokes he actually waved at us and wished us well. A couple of years later I got to interview the man for a football trade mag. He was managing Newcastle at the time and was obviously loving every minute. He was a wonderfully amiable interviewee and clearly cared passionately about the game and his players. At the end of the thirty minute chat I couldn’t help myself. I thanked him for his part in giving me one of the best summer’s of my life and asked him if he ever relived that moment when Platt’s toe was mms away from putting England in the final. He just sighed and told me that even if people had described him as an unlucky manager he felt he had lived a very lucky life.